This week on Comic Twart we take on the Punisher! This was done on black paper with white acrylic and some black ink. 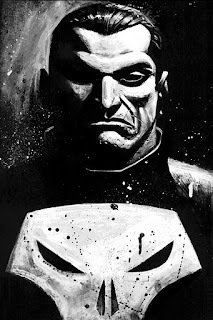 Dang....that's gritty....as I would expect with a Punisher drawing. I can only imagine how you'd approach a mob type book. Yeah, the dude is a mass murderer. You kinda have to deal with him in a visually ugly way.